Geoffrey H. Short currently (until 12 March 2011) has 7 of the images from his “Towards Another (Big Bang) Theory” on display at the Diemar/Noble Gallery in London. In literal terms, they are photographs of the rapid combustion of various volatile oils, but they are also much more that that. 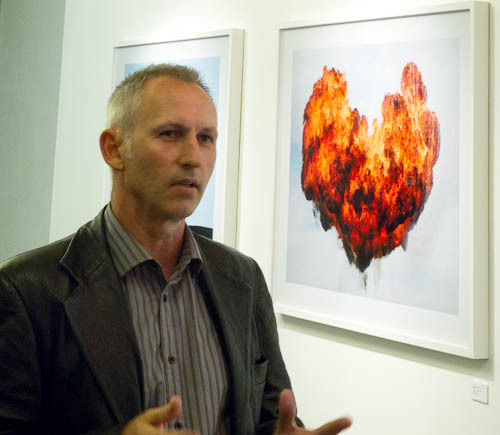 They are a visual stimulus to consider current social and political threats concerning terrorism, an issue that we in Europe and North America tend to be more aware of than in the photographer’s native New Zealand. Although this may be an immediate concern for some people, I found it more interesting to consider my reaction in terms of the fire and smoke. Fire, and the control of it, has fascinated man for tens of thousands of years: it can be life-sustaining and it can be fatal; it can warm and it can burn; it can cook and it can char. No wonder that it was long thought to be one of the fundamental elements. It inspires awe: that simultaneous attraction and repulsion we rapidly learn as a child when we touch something hot or, as Geoffrey put it “anything that can kill you must be fascinating”. There are echoes, too, of that 18th century notion of the Sublime: something that can be both beautiful and terrifying at the same time. But that opens a huge philosophical debate that would be way too long for a short blog like this! After about 5 minutes I went from a 3-dimensional understanding of the image as a representation of a rather beautiful moment in the brief life of a fireball to a 2-dimensional shape with an interesting texture. The heart-shape motif is obvious – do we love it or fear it, or both at the same time? brings to mind oriental calligraphy, or perhaps the work of an abstract artist. Scale is uncertain. We could be looking at ink drops in a jar of water or a disasterous mid-air collision. Wonderful! This has a wonderful depth and range of colours and is quite Turner-esque in its drama. We could expect a square-rigged man-o’-war to sail out of the flames at any moment. Or perhaps it could be the starship Enterprise returning from a distant galaxy – the image could easily be mistaken for a Hubble telescope composite of a distant nebula. I urge you to see this exhibition not just for the beauty of the images but for what they mean to you. There may only be 7 to view but they are well chosen and displayed. Well done Geoff – now, when can we see more?! Geoffrey has a YouTube video on the making of the images.